It’s like labeling the most abusive taking of our rights the “Patriot Act” whenever you need to hide the real abuse. He is calling the tax as suddenly necessary to ensure “safe” water. They paid for a study to show that 6 million Californians rely on water providers that violated state standards at some point in the last six years. The area impacted was Southern San Joaquin Valley and the Mojave Desert. Hey, that’s a great excuse to tax the entire state. Sources behind the curtain have states deeply concerned because they can see we are headed into a recession. This leg down should be harder moving into 2020. The whispers behind the curtain fear that revenues will decline sharply as costs will rise further with pensions for state employees. Nobody is yet willing to step up and say this system is collapsing and it is unsustainable long-term. They are only interested in raising taxes just to get by for the year. 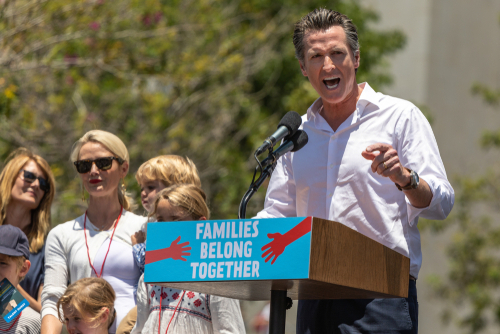 Newsom is concerned that revenue could drop $25 billion in 2019-2020. They are simply looking for other excuses to raise taxes. Ironically, California is the fourth-largest oil producing state. Before he left office, former Governor Jerry Brown signed a mandate that the state obtain all of its electricity from zero-carbon sources by 2045. That in itself was a very, very big deal. However, Brown also issued an executive order calling for the entire California economy to become carbon-neutral by 2045. The sheer cost of that where California is already the highest taxed state will most likely push its taxes perhaps even beyond France. This will become a major test for those cheering to stop Climate Change. It was precisely the Global Warming taxes that began the French protests of the Yellow Vests. Those in government NEVER look at what they are doing to society. They believe they possess the Divine Right of Kings to do whatever they please without regard for the people.